Greetings, Friends! Today’s topic is Italian Meatballs. Now, I have a confession to make. In all the mutt-like variety of my genetic and ethnic background, there is not even a bit of Italian. I have no pleasantly plump Nonna, nor do I have relatives back in the Old Country. I do, however, come from a long line of great cooks. In my mom’s family, It was usually Grandma T. who was busy in the kitchen making her delicious roasts, stews, soups, and strawberry shortcakes. Grandpa T. was the one keeping us all entertained with his crazy stories while we waited for dinner. Every once in a joyous while, though, Grandpa would head into the kitchen and make a big batch of his fantastic meatballs, usually to be used in meatball subs dripping with sauce and gooey with melted cheese. What follows is Grandpa’s recipe for Italian Meatballs. These are not fancy-shmancy meatballs with exotic spices or meats that you can only find a your local heritage Italian butcher shop (you do have one of those, right?) These meatballs are classic, tried-and-true deliciousness. Combine Panko and milk in a small bowl. When the milk has been absorbed by the Panko, add the resulting mush to the large bowl. This will keep your meatballs moist without affecting texture. Thoroughly mix all ingredients. I find the easiest way to do this is by hand; just have someone ready to turn the tap on and squirt some soap on your hands! Line 2 baking sheets with foil (I love the non-stick kind for this). 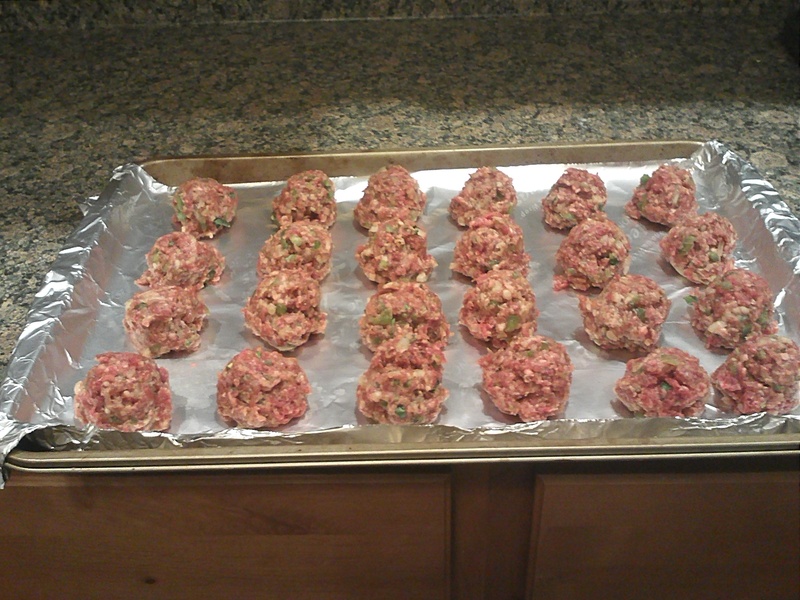 Using a small scoop or tablespoon and your hands, form mixture into meatballs, spacing evenly on prepared baking sheets. You should have about 30 meatballs. Don’t pack the balls too hard. Bake meatballs for 20-25 minutes, switching position of baking sheets halfway through baking. 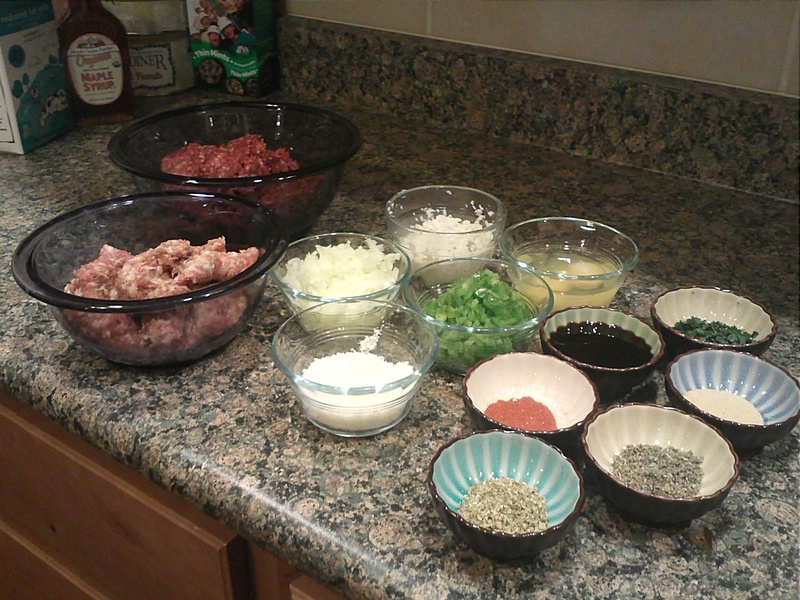 To use later, cool meatballs and divide among zip-top freezer bags or airtight containers. Freeze for up to a month. There’s always the traditional way, with tomato sauce over spaghetti. Or if you are looking for a better way that is gluten free and lower in carbs, try serving them over spaghetti squash. To prepare the squash, cut in half and remove seeds. Place in microwaveable dish with 1/2 inch of water. Cover and microwave on high for 15-20 minutes, or until tender. Use a fork to scrape the squash into pasta-like strings. 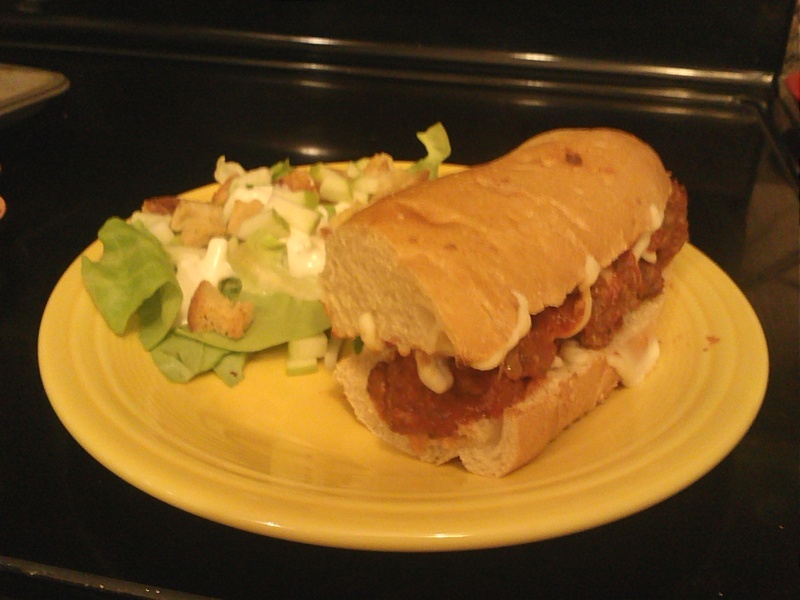 For meatball subs – my favorite – halve sub rolls and place cut side up on a baking sheet. Top half of each roll with several meatballs. Spoon tomato sauce over both halves, and sprinkle with mozzarella cheese. Broil on low for 2-4 minutes, until cheese is melted and bubbly. Serve with a crisp green salad. Do you have a favorite food memory? Share it with us! These look great! Love the green bell pepper addition. I hope you give them a try. The bell pepper gives just a little flavor and texture; it is a small enough amount that it does not overwhelm the rest of the flavors. Also, I love your blog title!